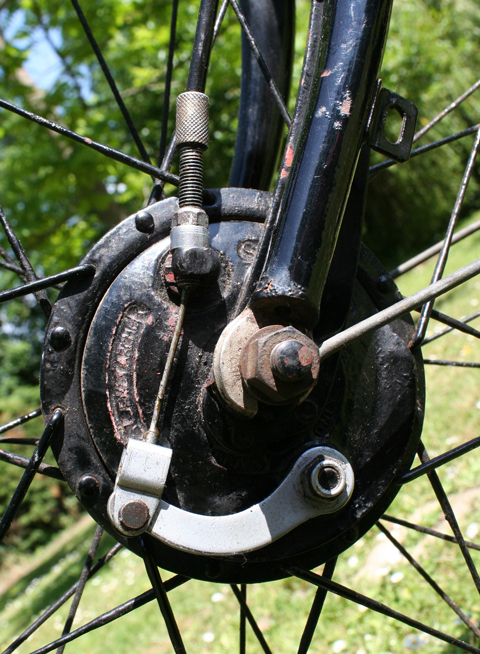 This is a T64 BSA Tandem fitted with Cyclo gears. 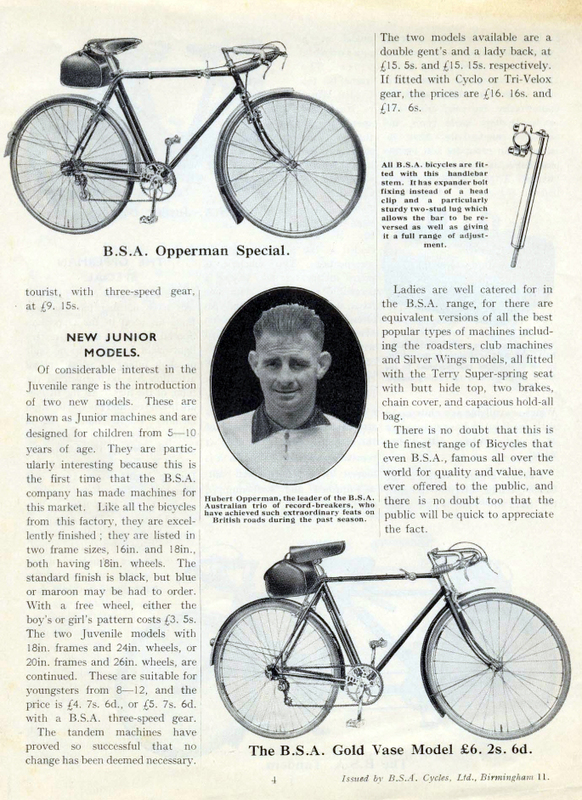 It was BSA’s most expensive machine for 1936, priced at £17 6/- . 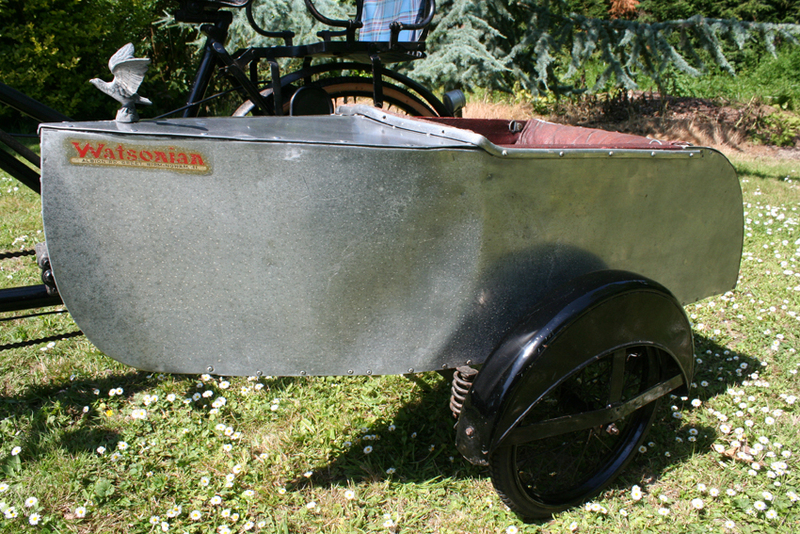 By comparison, the Opperman Special was £10 17/- 6d (or 25/- extra for flamboyant finish). With BSA’s excellent reputation, this was the top touring outfit of its era. 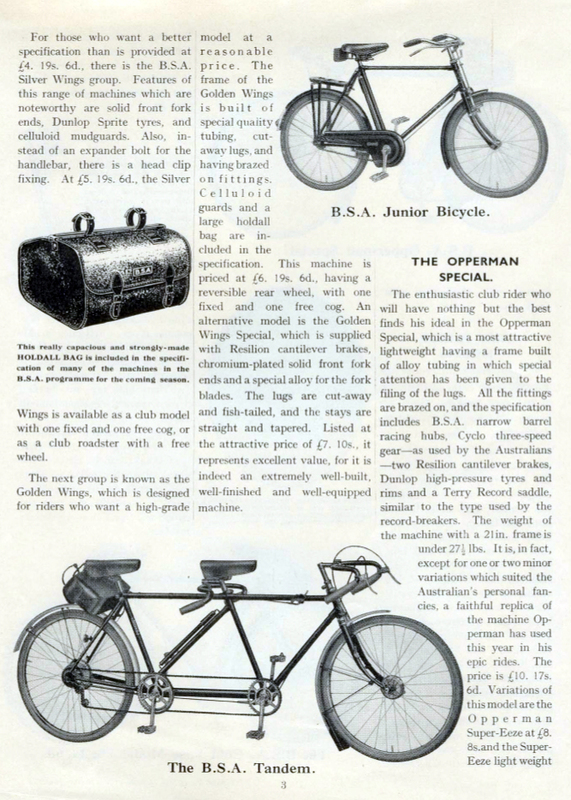 A new motorcycle combination would set you back around £70 – £80, while the cheapest fully equipped new car in 1936 was the Ford Model Y 8hp Two-door saloon at £100, £83 more than this tandem. On top of that, of course, were road tax, petrol, and maintenance costs. 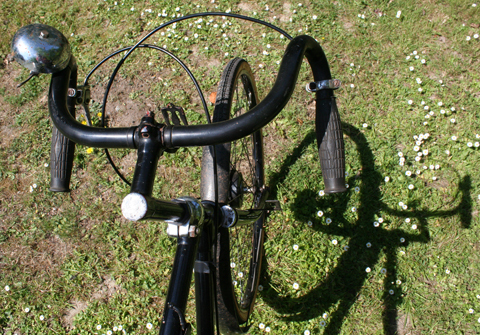 So you can see why tandems were popular. 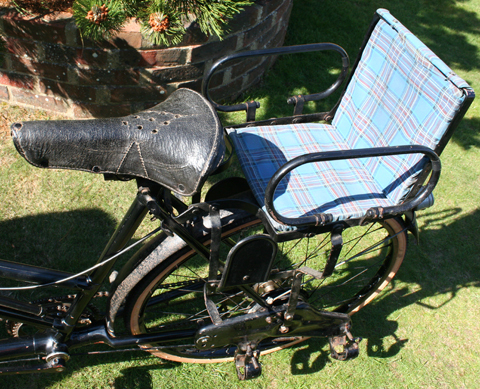 Fitted with a Watsonian child’s sidecar, and a folding child’s bicycle seat fitted at the stern, this BSA outfit would have provided cheap and reliable family transport for summer holidays. It has recently been serviced in my workshops. 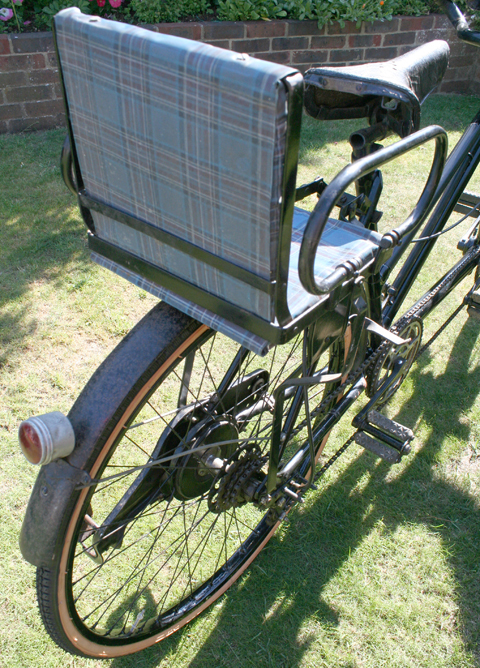 New tyres and tubes were fitted to both tandem and sidecar. 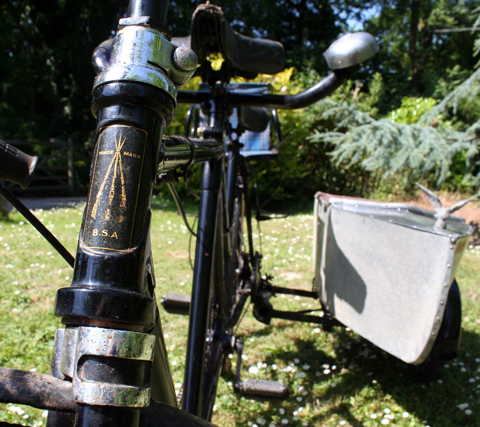 So it’s now ready to provide budget family transport in true thirties style. Wow. What a rig. I don’t know where to start. Maybe I should start with an apology for letting those ‘americanisms’ creep into my language? Well, I do have an excuse. Like American vehicles, this outfit takes up more road than the traditional British machine, so maybe such descriptive license is not, after all, out of place. There’s a lot to see on this machine, so let’s look at one part at a time. 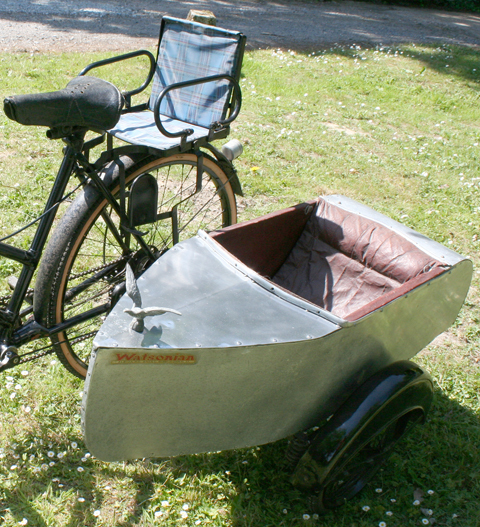 The sidecar is lightweight and very easy to detach. 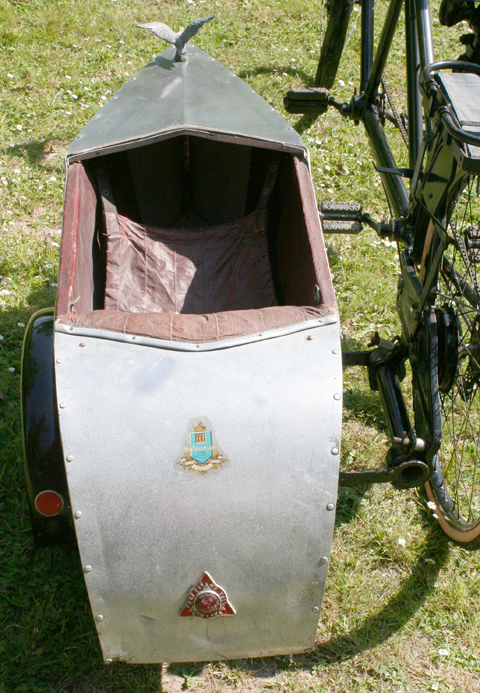 Lean the bike against a wall, loosen the two nuts and the sidecar comes off in two minutes. When you are pushing the outfit around, it seems quite flimsy. 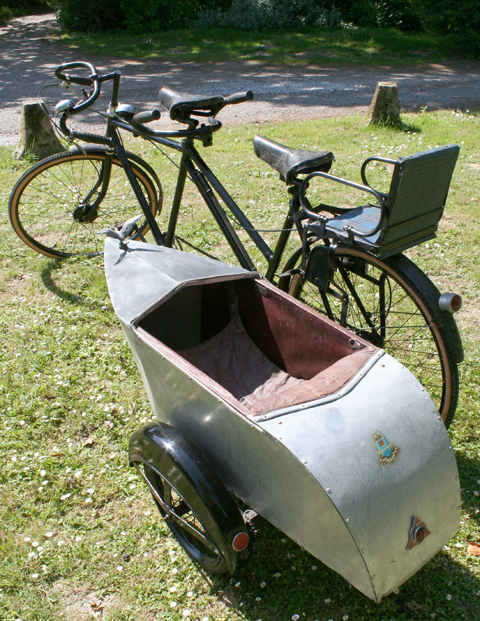 But, actually, when there are two adults on the tandem and a child in the sidecar it provides enough ballast to balance it well. 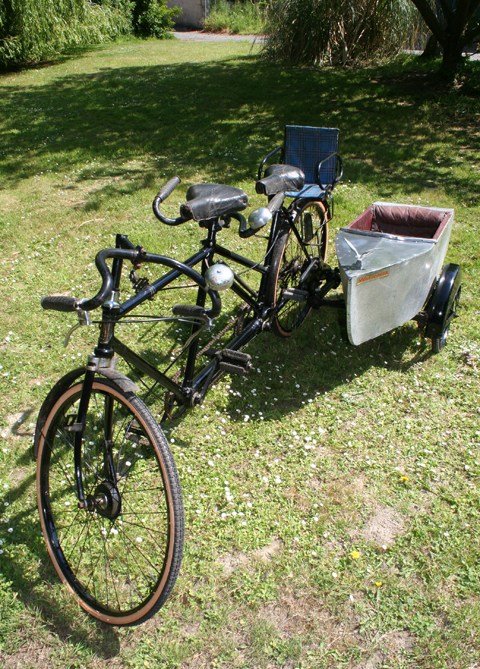 The tandem can be ridden easily with the sidecar fittings still attached to the rear wheel. 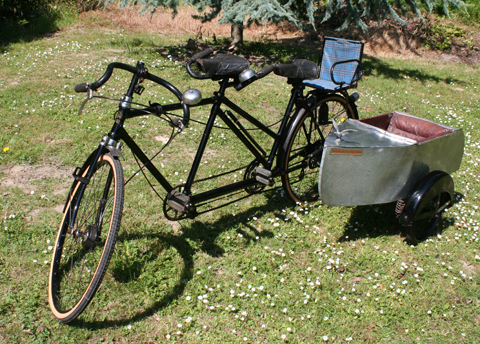 The front rider of a tandem is known as the ‘captain’ or ‘pilot.’ The rear rider is the ‘stoker’ (during the war, sometimes called the ‘tailgunner’). 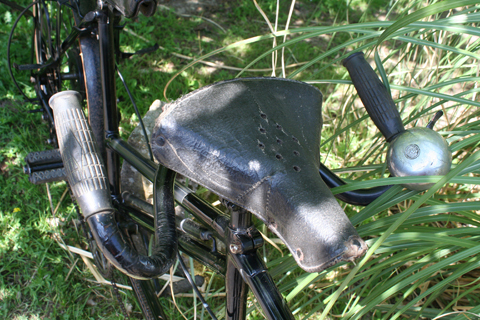 The saddles are matching, in good condition, and made by Terry. (This is correct for the year, as you can see in the catalogue). 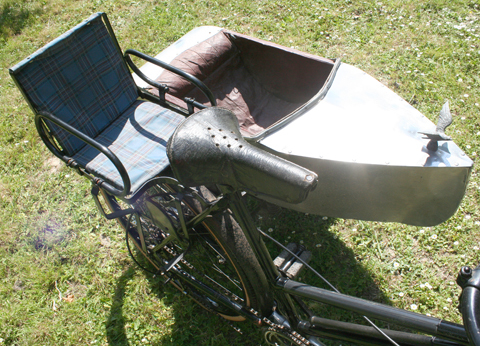 As you can see, the rear child’s seat folds flat. 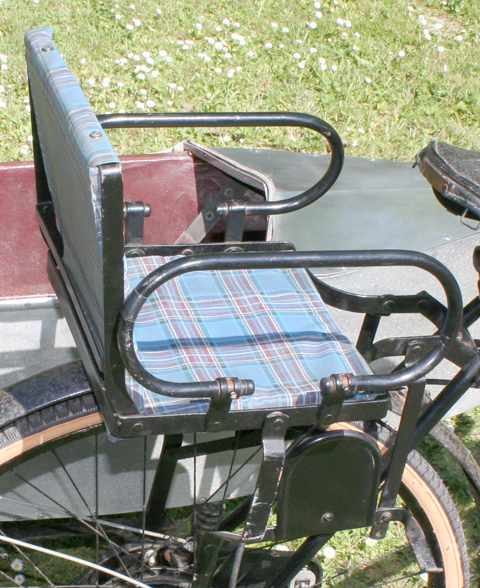 It’s a well-made seat, with footrests, and a fitting to prevent the child’s feet from straying into the rear wheel. 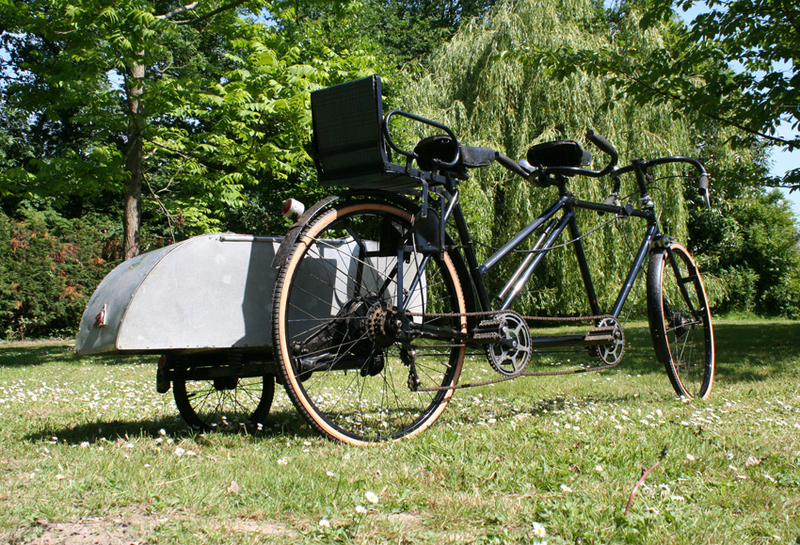 The earliest practical forms of tandem were contemporary with the introduction of the pneumatic tyre, around 1893. 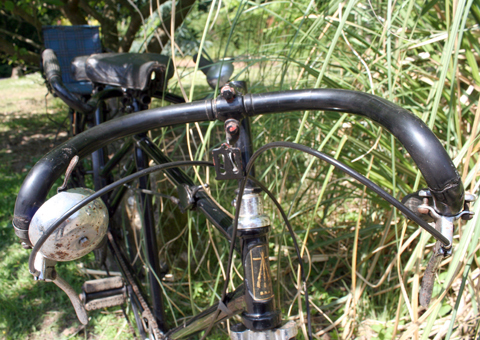 Safety bicycles were still a novelty, for the first time allowing ordinary folks to ride a bicycle – the previous style of high wheelers had required athletic ability. 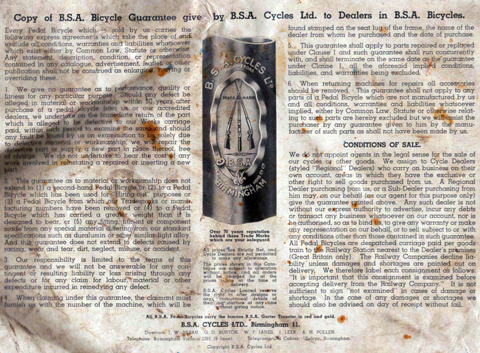 So the social aspects of cycling became important at this time, and a tandem obviously allowed a lady and gentleman to ride the same machine. 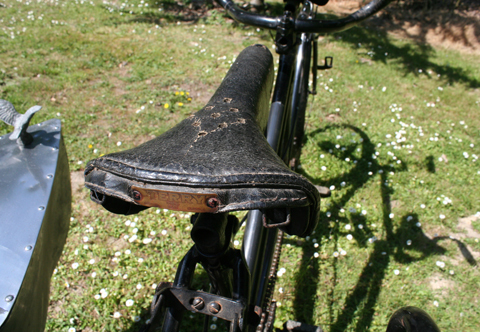 Early models were designed for the lady to occupy the front saddle. 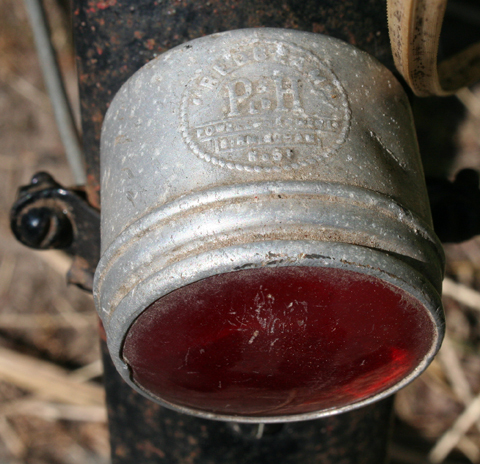 Pioneers of this type of machine were Humber, Singer, Rudge, Raleigh, Whitworth and Chater Lea. Though the lady rider occupied the ‘place of honour’ in front, she’d also be first to impact with any obstacles in the event of a collision. 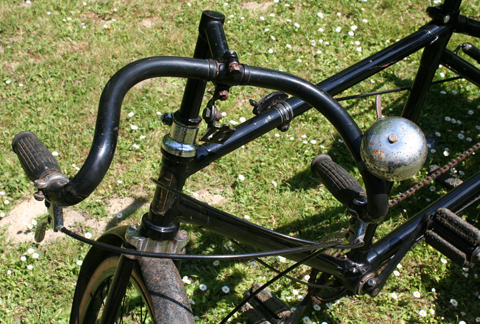 Steering and balancing were set up for the man behind, and to enable these functions to be controlled from the rear handlebar the two sets of handles had to be connected by a rod on the off side. 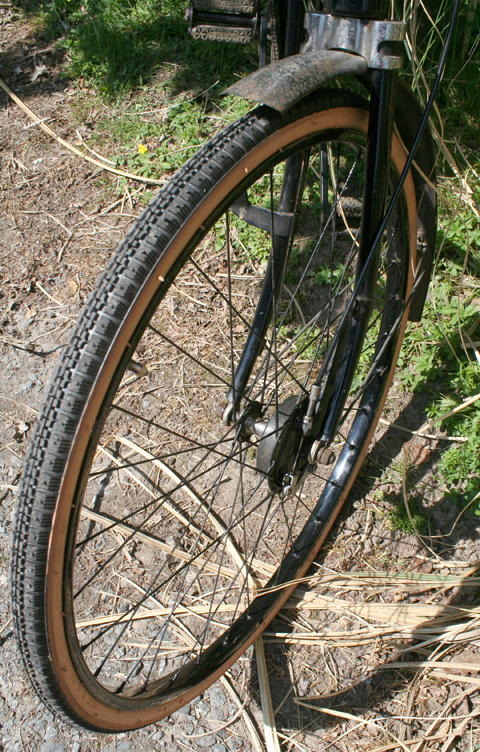 This arrangement meant that the front rider had handles to hold but was not expected to do any steering or balancing, or she interfered with her partner’s control of the machine, and by ignoring the instructions might cause a spill at a critical moment. 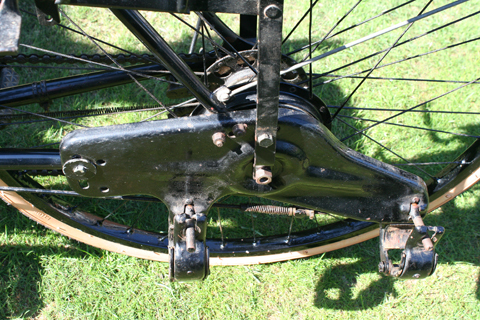 The early frame designs were rather crude, as might be expected, and consisted of a strengthened dropped front frame attached to a rear quadrilateral terminating in the usual rear fork. 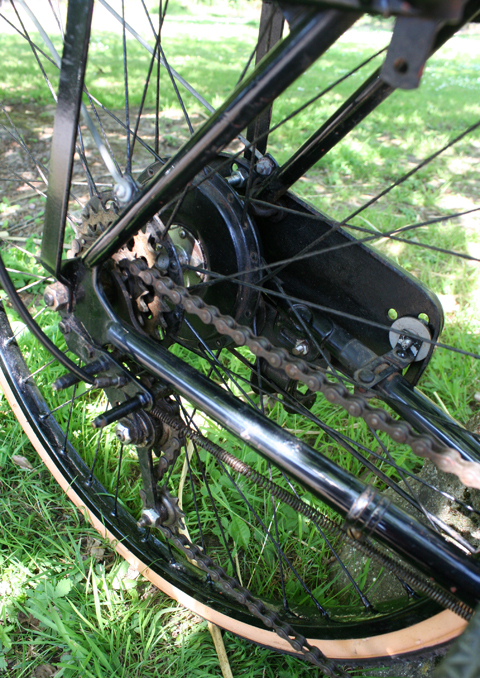 The rear rider’s pedal crank axle was connected to the front crank axle by a chain, so that the thrust of each rider’s pedals were communicated to the rear road driven wheel. 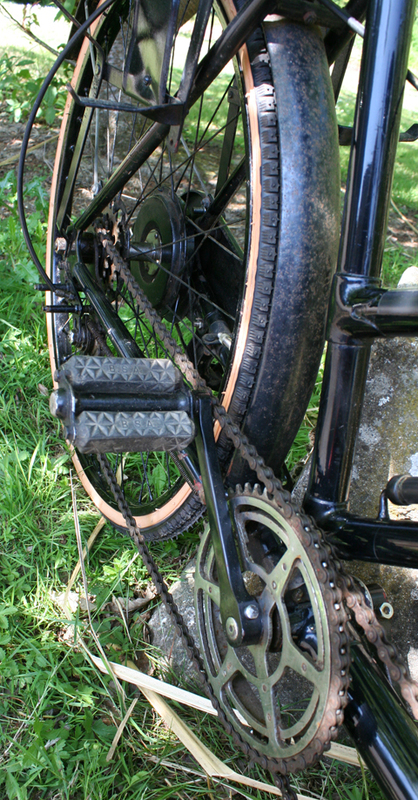 This type of frame was inherently weak, and much binding of chains and bearings caused the machine to run rather hard. 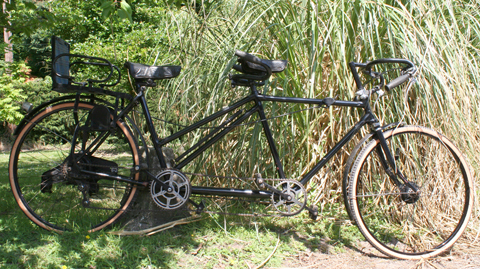 It’s difficult to say who first introduced the lady back tandem, but tandems for two male riders had been in use for a long time before the dropped part of the frame was placed at the rear. 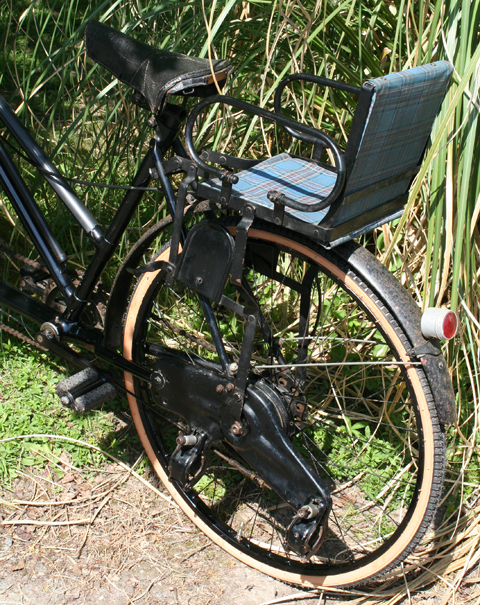 Possibly P. L. Renouf made one of the first lady back tandems, at Humber’s Coventry works, but doubtless others claim the innovation as their own. 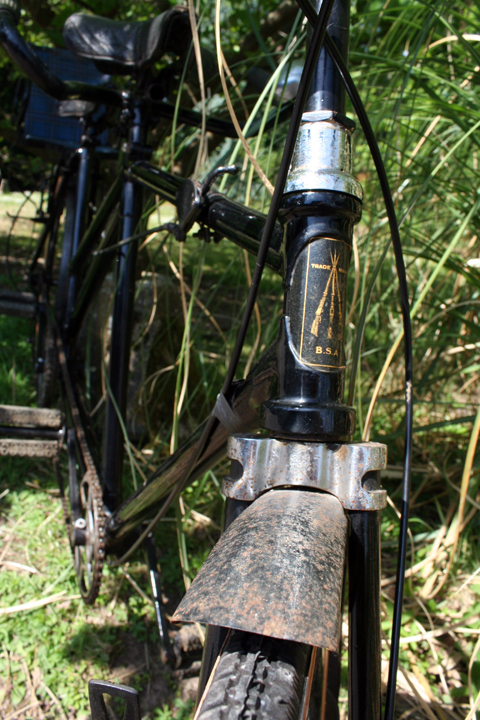 The design of G. P. Mills, at Raleigh’s Nottingham factory, was regarded as the most scientific type of tandem frame for many years. 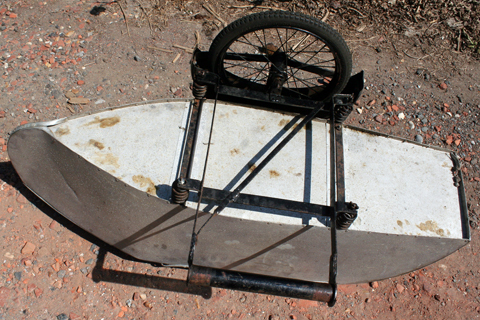 This frame was triangulated from front to rear and could be ridden by two women, wearing skirts, by a man and woman, or two men. 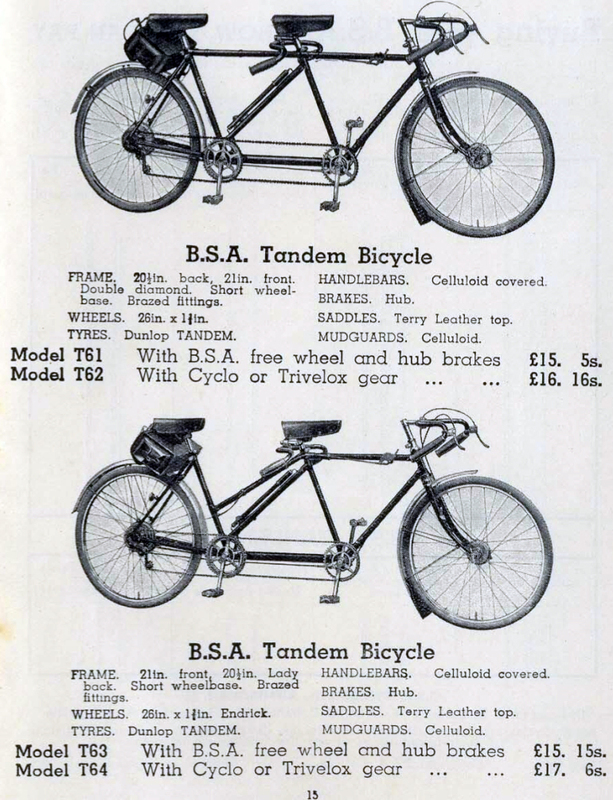 Illustrated below is the 1910 Chater Lea Lady Back tandem, in this case offered in component form in the Brown Brothers trade catalogue of that year. 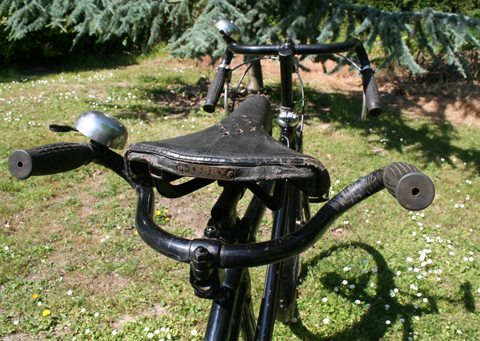 In the case of the lady back tandem popular in the twenties and thirties, the rear handle-bar was a fixture, and only the front one was used for steering and balancing in the usual manner. 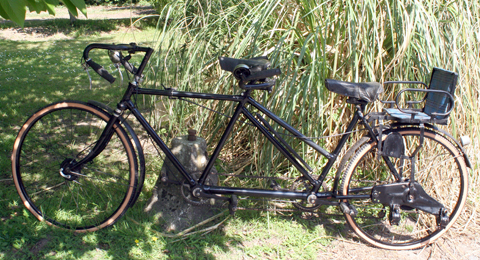 The increased cost of motoring led to a resurgence of the tandem’s popularity before WW2. 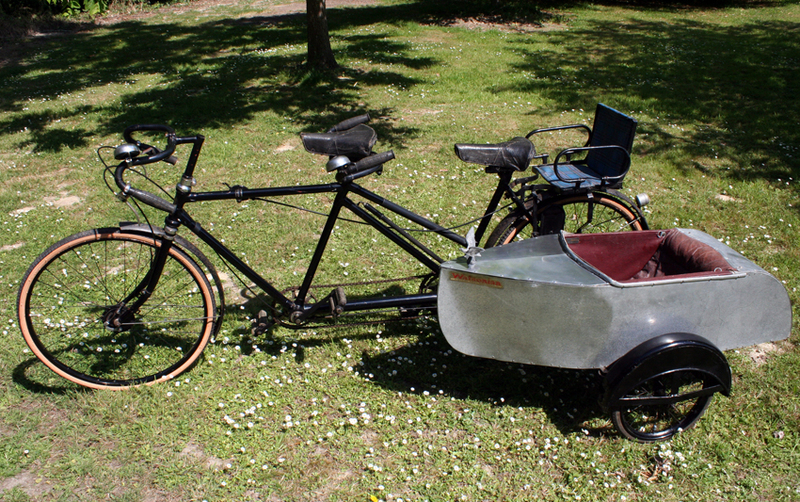 It may seem somewhat incongruous with our 21st century sensibilities to visualize a family tandem with juvenile sidecar. I can only assume that, with higher infant mortality in general, a few more toddlers coming a cropper in their child sidecars was not enough of an issue to require legislation. 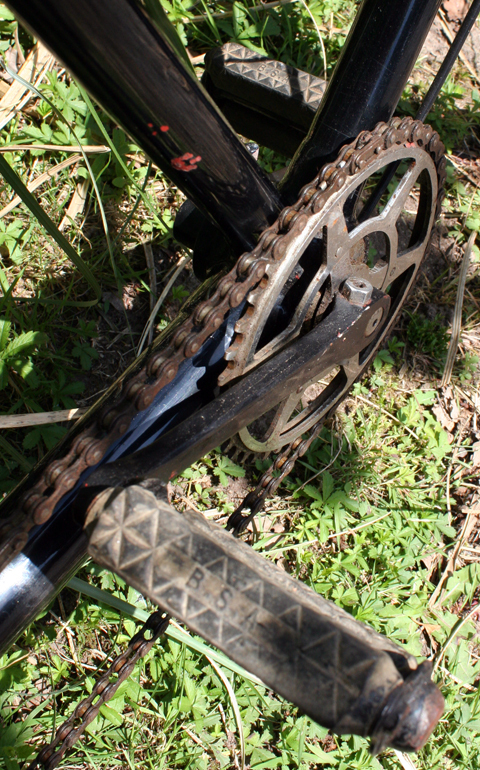 The only fault I’ve noted with the machine is that sometimes if you pedal backwards the chain can come loose. The long spring that you can see in the bottom of the picture below does not seem to be doing its job very well. 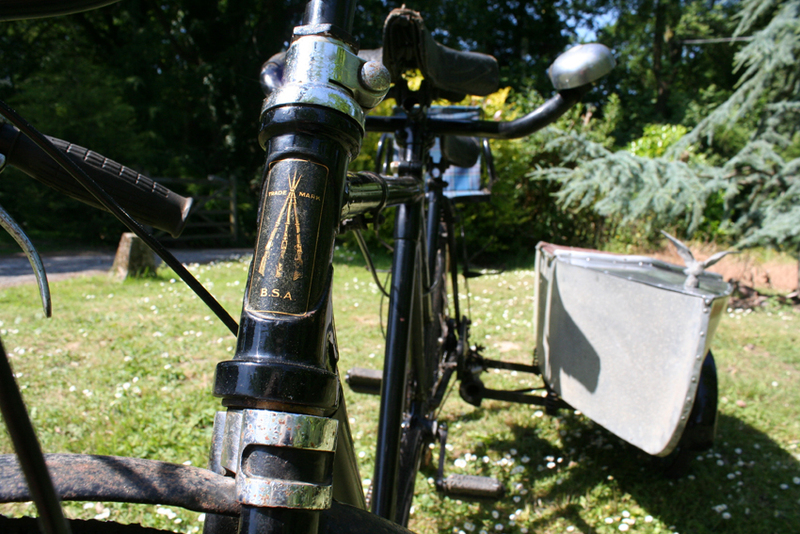 I’ve simply avoided pedalling backwards. 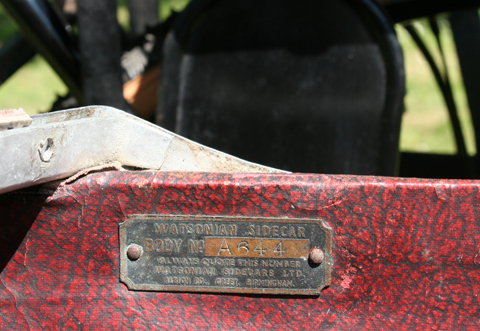 The sidecar is in excellent original condition, even retaining its original body plate. The seat is the usual hammock style. As you can see, it is well-preserved underneath too. The front emblem is a nice touch. 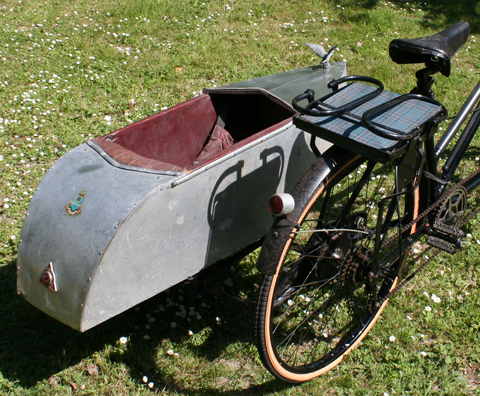 I fitted a new sidecar tyre and inner tube. 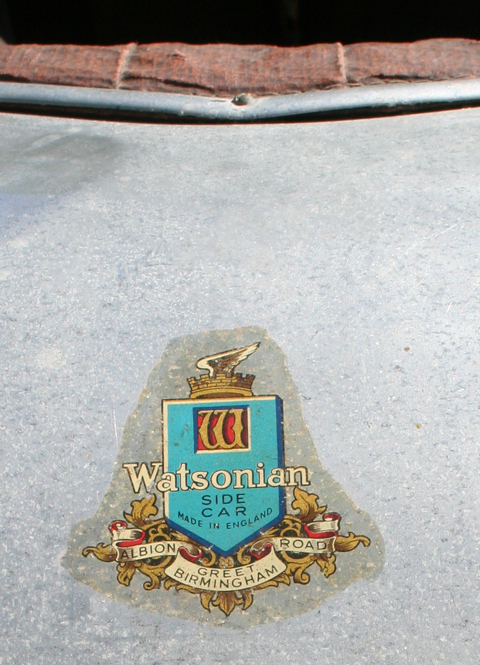 The Watsonian transfer on the rear is in good condition. 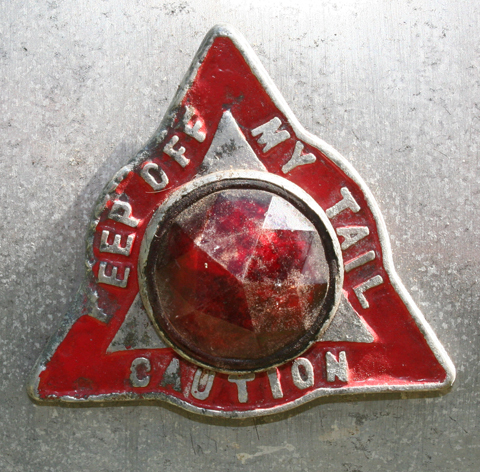 CAUTION: KEEP OFF MY TAIL.